The Tamil Nadu Assembly saw a huge showdown between the ruling All India Anna Dravida Munnetra Kazhagam (AIADMK) and the Dravida Munnetra Kazhagam (DMK) over the MLAs sting operation in today's session, which was earlier being expected to be crucial for paving the way for the rollout of the Goods and Services Tax (GST) Bill on July 1. Dhanapal supported his statements by citing the Nira Radia tape case that happened in the DMK's regime. 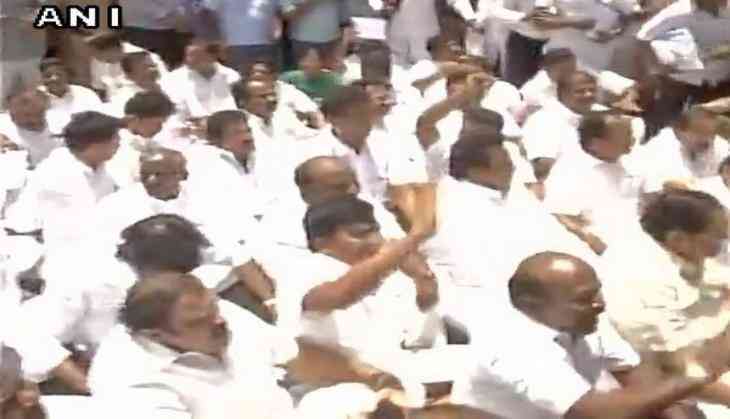 The Assembly came to a stalemate following which the policemen tried to take the protesting DMK MLAs out of the Assembly. The DMK MLAs then, led by Stalin, took to the streets to raise slogans against the AIADMK - 'MLAs for Sale'. South Madurai MLA Saravanan, who had deflected to the OPS faction, admitted on camera that Sasikala camp offered him money between Rs. 2 crores to 6 crores for his support. State Finance Minster D. Jayakumar refused to give an explanation apart from saying, "Like you, I also watched the TV. I don't know exactly what happened. The matter is pending before the court. Hence, it would be unwise to comment."